In Filipino cuisine, my favorite comfort dish is Chicken Adobo with rice. Any flavorful, marinated chicken paired with rice is going to appeal to me right off the bat. So it's no wonder that I'd be a fan of Arroz con Pollo (Chicken with Rice.) There are so many variations of this dish and I'm sure everyone that makes it has their own special touches to make it theirs. I've made Arroz con Pollo before but it always fell short - too mushy, too bland, not a good ratio of chicken to rice, etc. But now I can rest easy because this recipe is perfect, especially in the Instant Pot. Absolutely perfect. Chicken thighs are the ideal cut of chicken to use because they're a more flavorful cut (as opposed to chicken breast which tends to dry out.) To maximize the flavor of the chicken, it's briefly marinated in a mixture of minced garlic, salt, vinegar and black pepper. While that marinates, a sofrito is made by sauteing onions and bell peppers in the Instant Pot. The sofrito is pushed to the side of the pot and the marinated chicken goes in to brown up. Once the chicken is barely browned, chicken broth, water and tomato sauce is added. I adapted the recipe by using ketchup instead because I wanted the touch of sweetness it would bring to the dish. For added color and flavor, I also added a packet of Sazon - a 'secret ingredient' I like to add to all Latin inspired dishes. It's a common ingredient used in Latin cuisine that provides flavor (such as garlic, cilantro, etc) and color (a rich orange hue from annato that's included in the seasoning). You can find it in the Latin aisle of supermarkets. If you can't find it, no worries... the recipe will be fine without it. The chicken cooks a bit on the SAUTE setting before adding the rice, salty capers and pimento stuffed green olives (another adaptation I made in place of olives and pimentos called for in the original recipe). Once everything is in the pot, it's pressure cooked to lock in that deliciousness. After pressure cooking, the chicken is removed and deboned, then placed back into the pot. 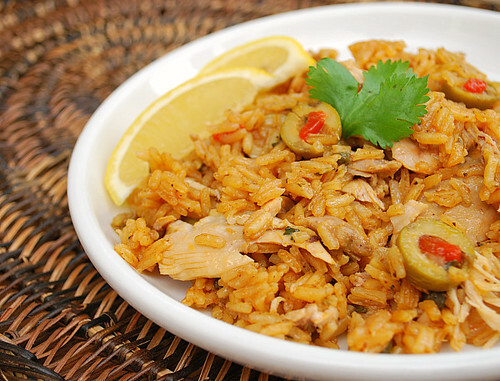 The chicken is folded into the flavorful rice and served. But hold on... the best is yet to come. If you don't mind testing your patience, this dish really is best served the next day when all the flavors have melded together. Heaven. Place garlic and 1 teaspoon salt in large bowl; using rubber spatula, mix to make smooth paste. Add oregano, 1 tablespoon vinegar, and 1/2 teaspoon black pepper to garlic-salt mixture; stir to combine. Place chicken in bowl with marinade. Coat chicken pieces evenly with marinade; set aside for 15 minutes. Press SAUTE on the IP and heat 1 tablespoon oil until shimmering. Add onion and pepper flakes; cook, stirring occasionally, until the onion begin to soften. Push the onions and peppers to sides of pot. Add chicken to clearing in center of pot, skin side down, in even layer. Cook, without moving chicken, until outer layer of meat becomes opaque and just starts to brown. Using tongs, flip chicken and cook on second side until opaque but not completely browned. Add ketchup, broth, and water; stir to combine. Add rice, olives, capers, bell peppers, half of the chopped cilantro, Sazon and 3/4 teaspoon salt; stir well. Once at pressure, the display will reflect 17 (the number of minutes you initially set) and will begin to countdown to 0 minutes. When the IP beeps after pressure cooking for 17 minutes, allow your IP to naturally release pressure completely - this can take 10-15 minutes. While naturally releasing pressure (also known as NPR or NR), the display will reflect numbers counting up from 1. The numbers indicate how many minutes the IP has stopped cooking since it beeped (or how many minutes it has been naturally releasing pressure). No need to touch your IP while it naturally releases pressure. The pin at the top of your IP will drop when all pressure has been released and it's safe to open. Let the IP automatically default to the WARM setting. Using tongs, remove chicken from pot and transfer to a plate. Using 2 forks, pull meat off the bones and into large chunks and set aside; discard chicken skin and remove remaining fat or dark veins from chicken pieces. Place chicken back into the pot on top of rice, cover, and let stand until warmed through, about 5 minutes. Add the remaining chopped cilantro, folding in to combine.